Yes, the Sundance Film Festival is all about discovering the next movie gem and giving Hollywood's finest a chance to revel in a snowy land of swag and furry boots. But, after a day of eye-drying back-to-back-to-back screenings, everyone has to unwind. And what better way to do that than with pounding beats and all-star rock bands? Meet Dave Grohl's Sound City PlayersAmong the biggest musical draws at this year's fest, which kicks off on Thursday night in Park City, Utah, is the live debut of Foo Fighters singer Dave Grohl's all-star Sound City Players. 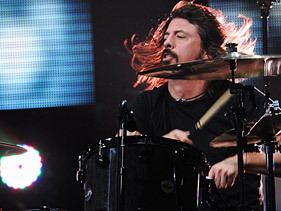 The group, assembled to promote Grohl's upcoming documentary, "Sound City," will take the stage on Friday night at an as-yet-unannounced venue. While the Sundance Sound City lineup hasn't been announced yet, a January 31 Los Angeles show will feature Grohl jamming with Stevie Nicks, Rick Springfield, John Fogerty, as well as members of Cheap Trick, Rage Against the Machine, Black Rebel Motorcycle Club, Fear, the Foo Fighters and Nirvana. A Little fun., A Little Pearl JamFun. 's Nate Ruess will be on hand as well to promote the greening project FilterForGood Bottle Free Bands Contest, a competition in which up-and-coming, environmentally conscious bands can win a comprehensive "Go Green" tour with carbon off-sets, locally sourced catering, biofuel for the tour bus and branded reusable water bottles to sell as merchandise to help fans kick the bottled water habit. His Friday night event at the Red Pine Lodge at the Canyons will also feature a gig by the supergroup 1-2-3 GO!, which includes the Dave Matthews Band's Stefan Lessard, Pearl Jam's Mike McCready and Fuel's Brett Scallions and Kenneth Schalk. EDM Goes To The 'Dance With NasEDM will also have its time to shine at the pop up venue the Village at the Lift, with DJ sets from DJ Vice (February 18), DJ Politik, with special guest Nas (February 19), DJs Jesse Marco, Sinatra and Theory (February 20) and Samantha Ronson (January 21). One of the legendary Sundance venues, Park City Live, will also keep well-manicured hands in the air thanks to EDM stars Nero (January 17), Afrojack (January 19) and Cedric Gervais (January 20). Come for the movies, stay for the lasers.